Add-on module supplied with microprocessor interfacing with the oxygen sensor – air/fuel ratio – and the sensor of air temperature. The setting of the module (which adjusts the injection timing, by increasing or decreasing it) is carried out thanks to simple operations on trimmers with graduated scale and does not require any additional software: this is how RapidBike put the idea of "Plug & Play" into reality! The two status-LED make the check of the correct working of the add-on module easier. 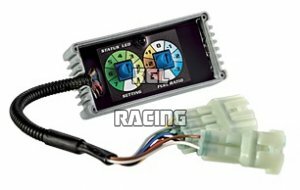 The module is supplied already set, in a kit: it interfaces with the wiring of the motorbike through original connectors which are definite for each model. Its manufacturing standard is specific for the Automotive sector and complies with important criteria such as electromagnetic compatibility, resistance to shock/vibration, temperature excursion and weathering agents (waterproof technology, etc).